Having a daughter altered my world in ways I never could have imagined, but perhaps the one thing that has surprised me most is my reaction to the “girly” things I despised when I was child. I know my mother scratched her head not infrequently as I climbed trees, kicked soccer balls, insisted on wearing the same pair of burgundy cords and blue swish Nike sneakers nearly every day and vociferously rejected every bow, dress or hairbrush she pleaded with me to try. I was, without apology, a tomboy. I wore my tough girl badge proudly and defied anyone to change me into a “little miss priss” (as I was apt to call my much more feminine younger sister). Dolls? Better to keep them out of my sight lest they become fodder for one of my games. I recall that while on vacation in Florida my friend and I hung my sister’s Norfin doll to the ceiling fan just for kicks. My sister’s persistent wailing did nothing to soften my heart. Don’t misunderstand. 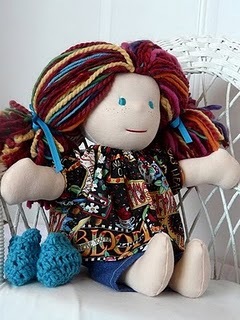 I loved (and still adore) my sister, but I truly detested the endless stream of dolls that inhabited our shared bedroom. When my baby girl was born last year, I pictured long days swinging from trees with my son and new daughter (a dream we shall certainly make a reality once I can find a local tree strong and safe enough to hold us), bug hunts, digging in the dirt, and evening games of kickball in the yard. What I did not envision was a nursery full of dolls … Waldorf dolls to be exact. That is, until I found Lightning Bugz. 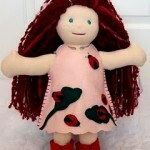 Don’t know what a Waldorf doll is? 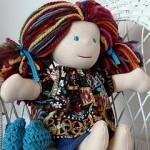 Not to worry … neither did I at first, but www.etsy.com is a virtual playground for lovers of handcrafted delights, and I passed many a tranquil evening perusing handmade dolls with cascading hair of every shade. 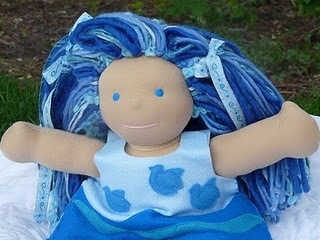 A Waldorf or Steiner doll is a doll made of natural cotton interlock knit fabric and wool stuffing crafted with European dollmaking techniques. The marvelous hair is generally of mohair or boucle. 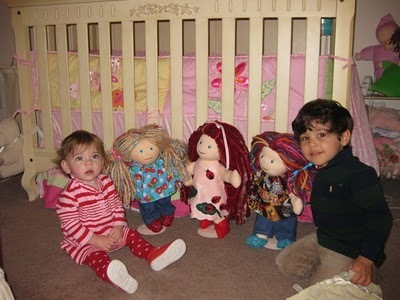 The intentionally simple facial appearance of the dolls inspires children to use creativity and imagination during play. 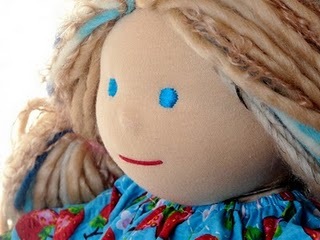 There are many Waldorf dollmakers whose dolls will fascinate children and delight parents, and you can expect an unending series of posts here about them, but today’s post is dedicated to my personal obsession: Lightning Bugz. My dear friend Candice is the heart and soul behind Lightning Bugz, and our home is watched over by Lizzie (the rainbow haired beauty), Ella (the custom ladybug fairy), Summer (the stunning blond and incidently the very first Lightning Bugz ever sold) and most recently Crystal (the icy blue fairy with blue jays prancing on her frock). 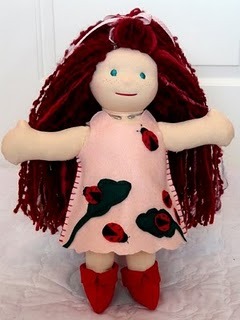 To say that Candic puts her whole self into making her dolls is an understatement. She pours her goodness into every detail, sizes, resizes, stitches and restitches until each little masterpiece actually feels like a living being. And they are magical, oh so enchanting creatures. 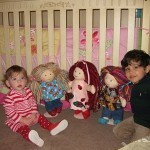 My daughter awakens each morning and greets her Lightning Bugz posse as if they were old friends. She snuggles them, rocks them, feeds them and loves them up in such a nurturing way that I am moved to my very core. Even my four year old son smiles at the wondrous colors and infinite variety of Candice’s bevy of beauties. Our Lightning Bugz are going to be with us for the long haul and will probably live to tell many a glorious story to my grandchildren. They are that well crafted. Get one and just try to stay away from Candice’s etsy site after that. It is impossible. Believe me … I’ve tried. It has become an addiction, but one that I am happy to live with for this point forward. If I have to be ailing, it might as well be from an obsession with the divine, darling dolls called Lightning Bugz. 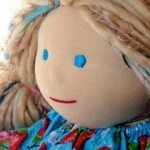 Other amazing Waldorf Dolls: Cristina at Bamboletta, Joyce at Hillcountry Dollmaker, Heather at Angelblankie, and Dragonsflyhollow. 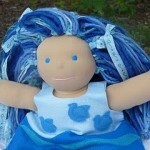 Up next on my blog: where to find natural open ended toys your children will love (if my children are any indication). We love our Lightning Bugz to! coming very soon and cant wait! Candy has been a pleasure to work with and is super sweet and makes ALOT of time for her customs and fans! I have a feeling these wont be our last two!